New York- With each coming day lately there is a new tragedy being announced by the takfiri evangelists who refer to themselves as ad-Dawlah al-Islamiyyah (the Islamic State). With a campaign noted for executions believed to be taking place in ar-Raqqah Governorate and sieges upon the bastions of religious minorities or anyone is simple doesn’t adhere to takfir practices, IS risked the global public becoming inured to their atrocities. So their latest meme is destroying artifacts and smashing some of the Levant’s most prized ancient sites in parts of Ninewa Governorate under their control. My interest in the Middle East began not with its intermittent warfare but with its rich archaeological history. My first trip to the region was to help excavate King Herod’s palace in Caesarea Maritima, not to cover an adrenaline-fueled war. As is my luck, war broke out during that dig between the IDF and Hezbollah. Suddenly digging around the biblical building blocks of the ancients felt somewhat irrelevant. What they are doing is not complete foreign in contemporary Islam as the state-orchestrated destruction of sites in Saudi Arabia is in keeping with Wahabi ideology that forbids the worshipping of ancestry lest it be deemed a form of shirk (idolatry) that runs counter to the narrowest interpretation of tawhid (monotheism) and is at least partly intended to marginalize Shia religious practices within the boundaries of the Kingdom. Little to no global outcry has slowed the demolition of holy sites in both Mecca and Medina. The Saudi monarchy has been obliterating history in accordance with its state-sanctioned ideology since the mid-1920s under the auspices of purifying the Arabian Peninsula. Many holy places in Mecca have been simply bulldozed to make way for mass market capitalism. Profit has replaced the physical history of the prophet. In a sense IS is continuing this policy writ large against Muslim, non-Muslim and pre-Islamic sites alike. 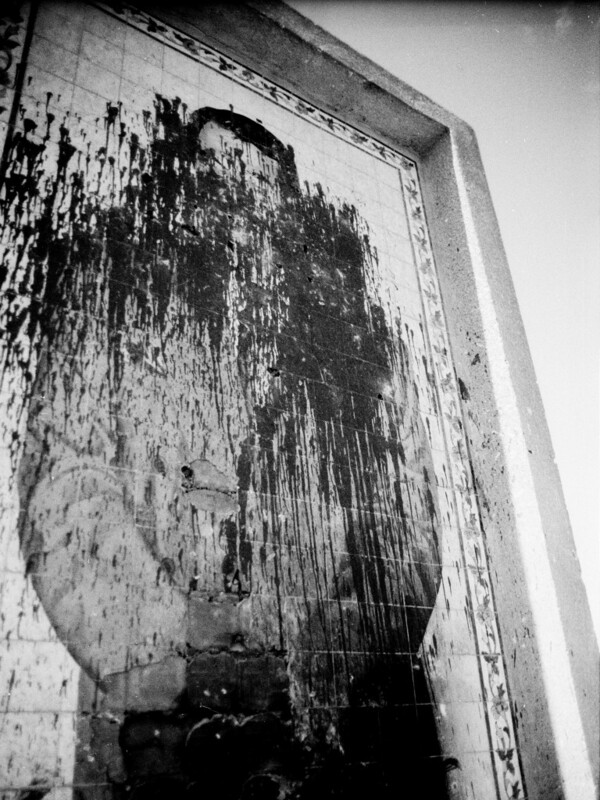 In March 2001 when when a Taliban set out to demolish the Hellenist-inflected Buddhas of Bamyan in central Afghanistan’s Shia-majority Hazarajat region, it was speculated that the Deobandi Islamists did so to thumb their nose at the world that isolated their largely unrecognized regime while collectively punishing the Hazara minority who they’d fought to bitterly in Mazar-e-Sharif in 1997-1998. The comparisons to the crime in Bamyan were inevitable. The reported razing of Hatra is but the latest of atrocities against Iraqi, and well pre-Islamic civilizational history of all mankind, following the demolishing of statues inside the unguarded Mosul museum, and destruction at the Assyrian capital of Nimrud and Ninevah. 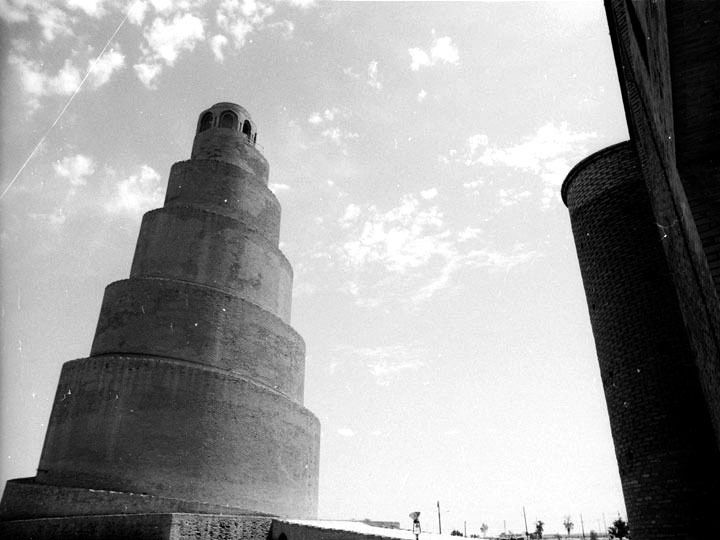 One of Iraq’s greatest Islamic monuments from the height of the Absassid caliphate is the spiral minaret known as the Malwiyya in Samarra. Along the banks of the Tigris, Samarra sits about midway between Balad and Tikrit–where a large scale offensive is currently under way–in a hotly contested area between the Iraqi state and its allied Iranian-backed Shia militia movements versus IS. Ostensibly the Malwiyya would not be slated for IS destruction as it represents a pillar of Sunni religio-cultural history, is in no way idolatrous, and does not depict graven imagery. But I’m being far too logical in my assessment I suppose. 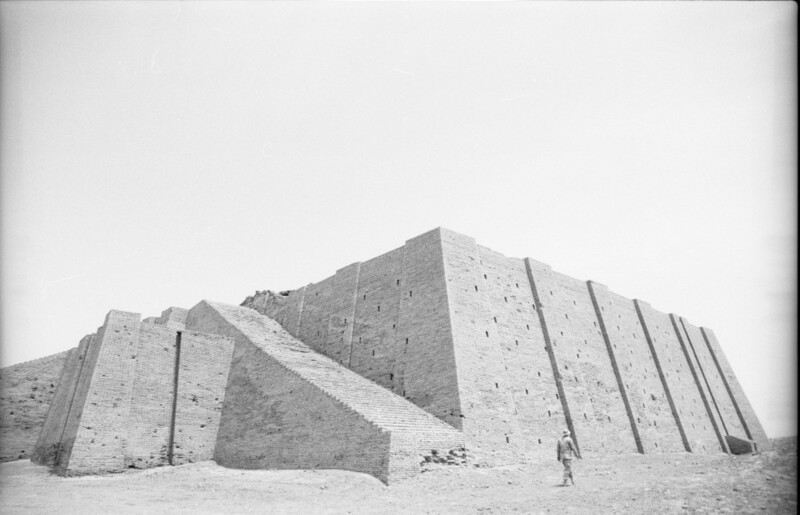 In its wedding cake-like tiers, it is somewhat evocative of, if not inspired by, a ziggurat. 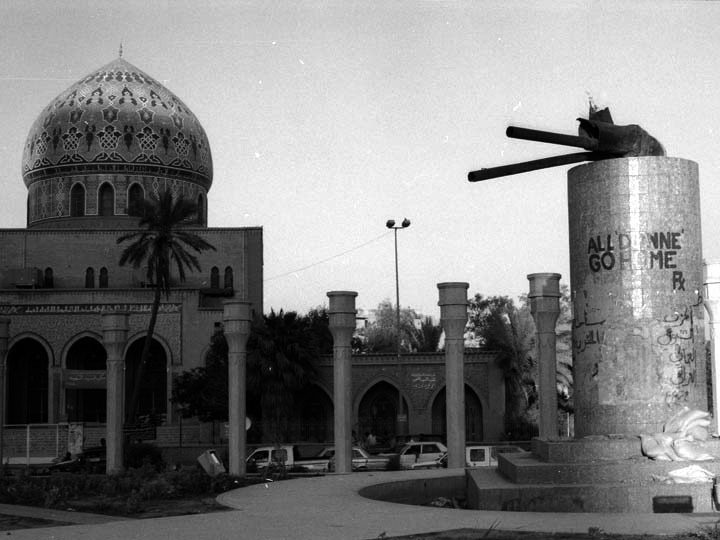 When the U.S. military barged into Iraq in March 2003, vandalizing Iraq’s Ba’athist history, namely the iconography of Saddam Hussein’s carefully crafted personality cult, seemed to be part of official Pentagon policy. Iraq had been vilified ever since the invasion of Kuwait in August 1990 and the ensuing Gulf War in 1991 that sent Iraqi troops retreating along the “highway of death”where stifled images showed the cruelty of such a precision air war. Although Iraq, and to a lesser extent neighboring Syria, are thought of as the ‘cradle of civilization,’ this geography has known little other than war and deep, violent internal repression for decades. Iraq’s culture coupled with the civilizational landmarks that remain within its present day geographical boundaries have not been incentivized to be respected. Aside from the well publicized destruction such as that which occurred in the Mosul museum, there has been widespread looting of sites for years to fund criminal enterprises and now outright salafi-jihad. The destruction gets the attention, the looting nets the income. Thus the IS assault on the country’s treasures in Ninewa comes as no shock. There is also a knee jerk response in social media that if one emotes a deep, genuine sadness for such an immeasurable loss, that one is somehow lessening the ongoing loss of human life in these places. It is as if the intertwined plights of history and humanity are inherently mutually exclusive. This makes advocating for these treasures appear to be a possibly insensitive act. Preserving Iraq’s vulnerable heritage was never explicitly part of the occupational mandate of U.S. forces in the 8 1/2 years they served in Iraq. Though it would seem Washington has the power, the military power, to stop this vast crime spree, it is not considered to be of paramount importance in the national security interest. Plain and unfortunately simple. Though there are initiatives like the State Department funded Syrian Heritage Initiative, the overall large scale political will is just not there. Iraq is too mired in intractable sectarian and ethnic fissures to do much to save its treasures while the Assad government in Damascus is concerned with solely with regime preservation. The future of the past indeed looks bleak for the time being.